Look! 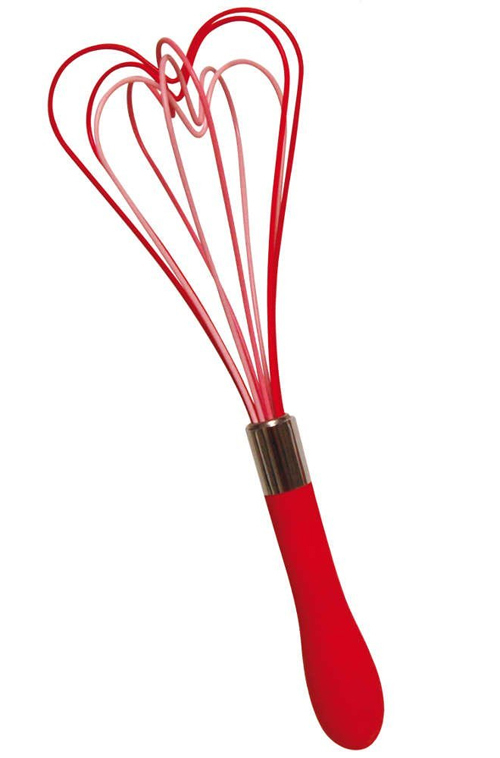 Even kitchen whisks wanna get in on the love. Made with Love. Silicone coated heart shaped wires gradating from pink to red. Measures 3.75 x 11.5-inches. I am not sure what I like best about this I Am A To Go Cup design. First off, there is the name. No mistaking what this thing is. Then there is the little liquid container that screws into the cap. Clever. One can keep wet ingredients away from dry. 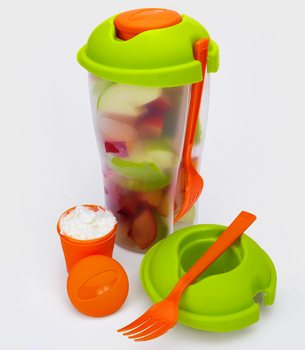 Then, to top it all off, it comes with its own fork – and the kicker is that the cap acts as a utensil rest to boot. Nice design all around. Perfect companion for that paper cup that isn’t — just keep it straight which one is which. Candy canes are nice to look at; eating them… well, eh. Let’s just say there are plenty of other candy options that many would reach for first. Perhaps that’s why they are only plentiful during one time of the year. (Just like the evil creation known as candy corn.) Luckily there is a way to have your candy and not have to eat it too. The DCI Candy Cane Tea Infuser is a clever way to enjoy the ubiquitous holiday ‘treat’ without having to pry it away from your teeth hours later. Fill with tea leaves, steep as desired and relax to a nice cup of tea. Perhaps while hanging real candy canes on the tree. Have a delightful cup of tea at the Holidays with this Candy Cane Tea Infuser. This red and white striped infuser will hold your favorite tea leaves and brew you the perfect cup of tea. 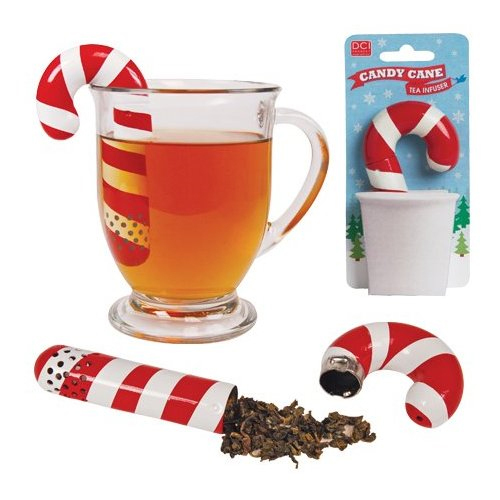 Simply put loose tea inside the candy cane, close and hang from your mug. Fill with hot water and brew tea to your desired strength. Remove infuser and enjoy. It wasn’t too long ago that dinosaurs were all the rage with the kids. Well, those kids grew up and moved on from mac and cheese to more grown-up tastes. That includes ditching the juice-filled sippy-cups for more sophisticated beverages. Like tea. But that doesn’t mean the fun has to be left behind. 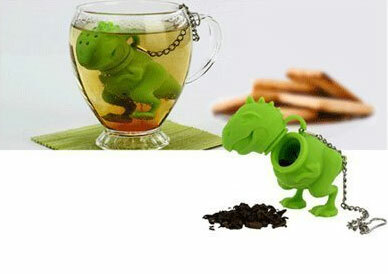 The Tea Rex Tea Infuser gives those who don’t want to grow up just yet something to hang on to. The little dinosaur is made to hold loose-leaf tea and includes a chain for easy tea steeping. Fill with your favorite tea leaves, hang it off the side of your teacup and transport yourself to the past. Salad is rabbit food, as they say, and no better way is that proven than with these Rabbit Ears Salad Servers . 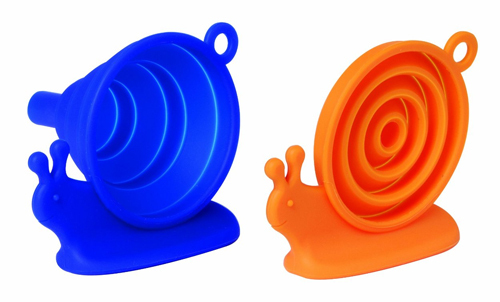 When lurking in the salad bowl, this set of two salad utensils act as an amusing accessory at the table. 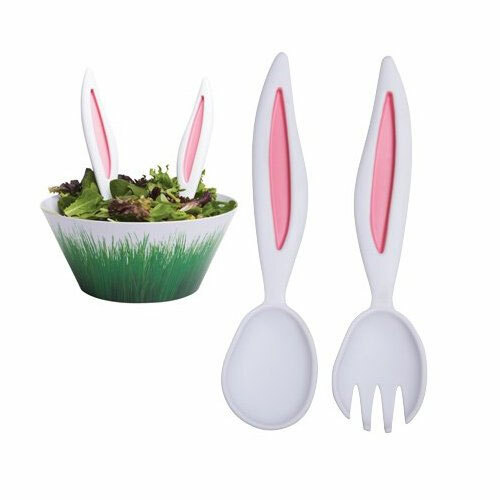 The fork and spoon salad serving set might make a good way to get kids interested in salad, but then again they might be disappointed to find that there is not a real bunny rabbit at the other end of those ears.